MoMA PS1 has launched a new interactive installation Lumen, which won the Museum of Modern Art’s 2017 Young Architects Program. Lumen was created by Jenny Sabin Studio and was opened to the public on June 29. 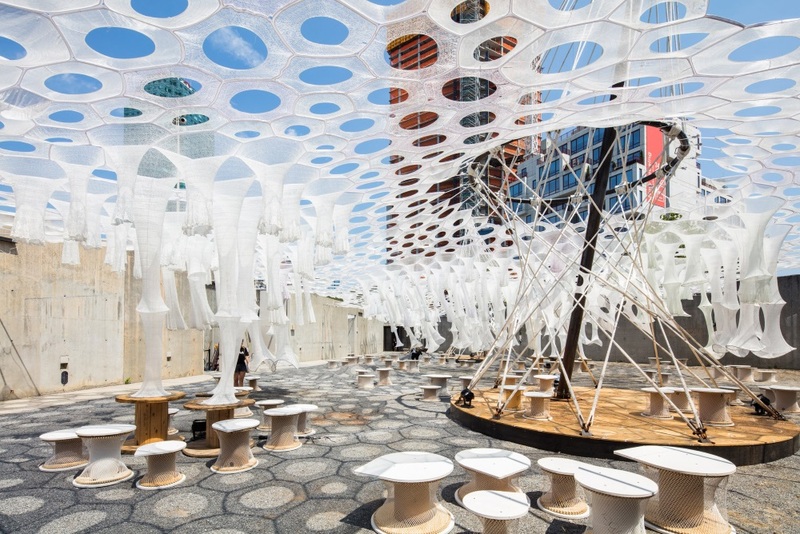 Jenny Sabin Studio designed the structure so it would feature as many sustainable ideas as possible, with the canopy built from recycled photo-luminescent textiles. These textiles collect solar energy throughout the day, while spraying a light mist onto visitors below to keep them cool. At night ,the exhibit uses the collected solar energy to power the lights that run throughout the tubular towers, interacting with light, heat and movement, and encouraging visitors to reach out and touch them. The structure will be used to host various outdoor concerts throughout the summer.